In Seychelles Freemasonry met with the Seychelles Club. This created an unholy marriage. The result is a total corruption of its values and morals. A lust to continue enslaving ordinary Seychellois using the system of control perfected by Freemasons in grand terre. Look again at this picture. Look at the people in it. There are people from SPPF and people from Opposition. They don’t care about political parties. They care only about each other Freemasons and eating their cake together. Albert Rene was a Freemason. That’s why he was allowed to have his Coup d’etat in 1977. The business of his fellow Freemasons were never touched. Look how they have prospered under his protection! Judge Karunakaran is a Freemason. He was brought in by Albert Rene to give judgements in favour of Freemasons. He does not care about the rule of law. Only the rule of corrupt Freemasons of Seychelles. He has ruled in favour of many Freemason’s and denied justice to non Freemasons. He has willingly offered and done the same for opposition to gain their favour and support. 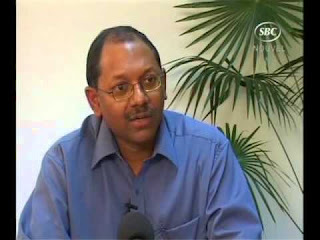 According to the Freemasons plan Karunakaran was supposed to become Chief Justice and continue the corruption of Justice in Seychelles. Under James Michel the Freemasons lost a lot of power. James Michel is not a Freemason. He appointed a lot of non Freemasons to key positions. This killed their power and dismantled their hold over society. This included appointing Matilda Twomey as Chief Justice instead of Karunakaran. This is why the so called opposition hates James Michel even more than Albert Rene who led the coup d’etat. But the Freemasons have been fighting to come back to preserve their corruption. Today it is clear that the Freemasons are becoming stronger under Danny Faure. More and more corrupt stooges of the Freemasons are coming back into key positions. They have even brainwashed diehard opposition supporters to call for Albert Rene’s mercenary judge to be returned as Chief Justice. Instead of one who has just cleaned up the corrupt filth from the judiciary and lawyers! So this is really who wants the Chief Justice removed in Seychelles. It is not for the good of ordinary Seychellois. She is an obstacle to their selfish greed and corruption. They now want to use the flimsiest of excuses and an illegally conducted process to force her out. Enough is enough, it is time to expose this corrupt freemasonry in Seychelles and clean it from our society once in for all! It is time to free Seychellois from the grip of this rotten corruption of freemasonry.